Summary of today’s show: The HHS mandate of the Affordable Care Act is an unprecedented infringement on religious liberty, according to a wide cross-section of religious leaders and political observers. 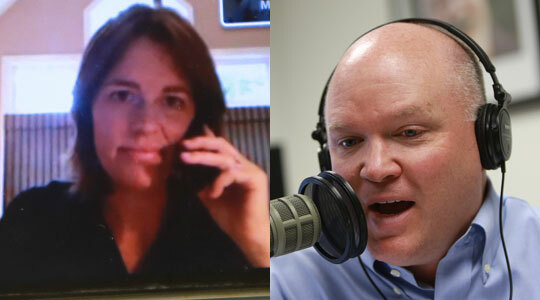 Scot Landry talks to Kim Daniels, an attorney who specializes in religious liberty issues and coordinator for Catholic Voices USA, about the HHS mandate and other attempts to infringe on religious liberty during this Fortnight for Freedom called by the US bishops. Daniels will be one of the panelists on the Fortnight for Freedom town hall airing on CatholicTV and WQOM tonight at 8pm. 1st segment: Scot said tonight Cardinal Sean will be hosting on the live town hall meeting at CatholicTV at 8pm on the topic of religious liberty. On of the presenters joining is Kim Daniels, an attorney working on religious liberty issues and is a coordinator for Catholic Voices USA and lives in Maryland. Scot said he met Kim when he attended a meeting in Washington, DC, of Catholic Voices USA. Kim said the group is lay Catholics who stand up and talk about our faith and why we love it, making the Church’s presence felt in the public square. They don’t speak on behalf of the bishops, but do speak authoritatively because they know their faith well. It’s an outgrowth of a similar successful group in England last year that began before the Pope’s visit. Scot said Catholic Voices is launched while we’re fighting to defend our religious freedom. Kim said they saw a need for lay Catholics to be out there on this issue.They want as many lay Catholics talking about it as possible because it’s important we tell everyone how it’s under siege today. Scot asked Kim to provide background on the HHS mandate. She said it’s part of the Affordable Care Act. Last August, the Dept. of health and Human Services put out a regulation that all employers provide insurance for contraceptive services under the ACA or face a fine. The only exemption was for a narrow definition of churches. Church-related organizations were not exempted. In January this year the president affirmed that this was going to be the rule and then later proposed an “accommodation” which was only an accounting trick. For the first time, religious believers would be forced to provide a good or service that violates their faith. Kim said the problems with the “accommodation” includes the idea that insurers would be forced to provide the coverage rather than the employers, but of course the costs would be passed along to employers. The employers would still be forced to participate. Also, many church organizations are self-insurers. Kim said religious liberty is our first freedom. One of the central reasons people came to this country was to escape religious persecution and that’s what the first amendment was about. For Catholics especially, it’s important, because it it’s the glue that holds civil society together. Catholics found civil society institutions that stand between individual and government and provide the glue for society. Scot asked what makes the HHS mandate so bad. Kim said the mandate has an extremely narrow definition of what counts as a religion. You’re a religious organization if you primarily employ people of your faith and promotes your faith. If reduces religion to freedom of worship within the four walls of the house of worship, not freedom of religion. Mother Teresa would not qualify for the exemption. Scot said we don’t serve other because they’re Catholic. We serve others because we’re Catholic. That’s what defines us as Catholic. Free exercise isn’t freedom of worship, but freedom of religion, which is prayer, belief, and action, and more. Kim said look at the list of the Catholic organizations that have signed on to lawsuits against the HHS mandate: publishers, colleges, nursing homes. For every corporal work of mercy, you can find an organization that has signed on. Scot said some people believe Catholics have been targeted specifically. Cardinal George of Chicago said this is an unprecedented requirement that we be forced to act contrary to what we believe. This has never happened in the US. Kim said we know there’s been plenty of religious bigotry in history. It’s important to remember here that what’s going on is that people are being forced to pay for something that violates their deeply held religious beliefs. Once this precedent is set, you can violate beliefs in other places as well. A good example is conscientious objection to serving in war. That could be threatened. Scot said when there are laws passed, there’s usually a robust set of exemptions for different groups. Scot said the Affordable Care Act has many exemptions, but the exemption for Catholics was so narrow it violates our religious liberty. Scot asked Kim how exemptions work in laws like these? Kim said we have a longstanding bipartisan census in favor of religious liberty and exemptions for religious conscience. President Clinton signed int o law the religious freedom restoration act. Ted Kennedy had written to Pope Benedict that he was in favor of strong exemptions for Catholics. But what happened here is the Obama administration has set all that aside. Scot said the troubling part of this is that the Secretary of HHS came out with a list of preventative care that’s covered under the law that included contraception and abortifacients, when real preventative care wasn’t included. Kim said wouldn’t it be great to have free health club memberships or blood pressure medicine or the like? But instead contraception, sterilization and abortifacients are. That shows they are presenting pregnancy as a disease to be prevented. Kim noted that the Amish got an exemption from the Affordable Care Act as did millions of people who were grandfathered. 2nd segment: Scot said on this issue, Catholics of all stripes were all united that this was a massive violation of religious freedom. Kim said when the mandate first came down, she heard people talking about in her parish in a way that you don’t see normally. They saw it as an attack on them and it’s created a solidarity. The lawsuits show a wide array of groups participating from small to large and across the viewpoint spectrum. An important development last week saw the Catholic Health Association, which had supported the Affordable Care Act, came out against the HSS mandate and the supposed accommodation. Kim said the institutions that will not provide the objectionable goods and services will be subject to fines of $100 per day per employee. For large organizations and small ones that is significant. It will lead some to shut their doors. Others will reduce their services. It will have a big impact on our network of schools and social service providers. Scot has asked if there’s a precedent for fines that are so crippling? Kim said this is what’s unprecedented: That the government is forcing us to make that choice between our religious beliefs and paying these crippling fines. Because we are an institutional church, we work through groups we form, not just through individuals, it affects us uniquely. It’s not just a Catholic issue, but it particularly affects us. Scot said there are about 200 Catholic universities in the US, about 7,000 secondary and elementary schools, 1,400 long-term healthcare centers, and hundreds of hospitals. The most important thing for the common good is not the the number of institutions, but the people who are served here. Kim said the key issue to remember is that at the end of the day this will harm the poor, kids in schools, those served by Catholic services. Kim said when the government says to some that they are not meeting the narrow exemption, it involves the government coming in and defining whether they are religious. The government becomes entangled in the practice of our religious faith. Scot said this violates the separation of church and state. Kim said it goes to the Establishment clause. It’s setting up a regulation that determines what it means to be religious. Scot asked Kim to respond to the claim that the Church is trying to impose its views on others, including employees who don’t agree. Kim said the Church only seeks to retain the constitutional right to propose it’s views as a full participant in public life. It’s the government is coming in to tell the Church what it should believe about contraception and abortion.Kim said contraception is cheap and widely available and the government could take many steps to provide it easily without forcing religious believers to violate their beliefs. People coming to work for the Church know or can easily know what the Church believes coming in the door. Kim said when the Catholic Health Association came out against the mandate, they made this argument. Scot said he’s also heard that the Catholic Church is trying to hurt Obama’s re-election campaign. Kim said the plaintiffs in the lawsuits have all different political views. If anyone is trying to politicize this issue, it’s the Obama administration. Scot said that’s another slogan he’s heard, that this is a War on Women. Kim said it’s clear that it’s a manufactured war. It’s patronizing for the administration to claim that religious freedom isn’t as important to women. 30,000 women have signed up for an inititiative to say this. Scot said it’s a beautiful letter. He’s said the issue can turn in this country if women stand up and say that NARAL and NOW don’t speak for them. Women aren’t one-issue voters who only care about abortion and contraception. Kim said it’s patronizing for the Obama administration to call this a women’s issue because it involves contraception, abortion, and sterilization. Scot said 43 Catholic institutions filed a lawsuit on one day in late May, adding to 11 previous lawsuits. Kim said it was an unprecedented coordination of lawsuits among Catholic groups. As a civil rights matter it’s striking to see organizations come together to file suit across the country to show that it matters to all of us. It’s also important it was filed then because the Supreme Court’s decision on the Affordable Care Act is imminent. Plus the clock is ticking: Catholic organizations need to purchase insurance. Scot said some in Boston thought the Archdiocese of Boston should have filed a lawsuit too. There are 195 dioceses and parches in the US. He asked what about groups that didn’t file a lawsuit? Kim said the suits are directed against just the mandate. There are lots of reasons while you would have some plaintiffs sign on and others not sign on and why you would file in the some places and not in others. It’s mainly a tactical question. Scot asked how long it will take to see this resolved. Kim said it depends on what happens in the next few weeks and months on these issues. You could see them happening in the next year. Scot asked how the 43 lawsuits might be affected by the Supreme Court decision on the Affordable Care Act itself. If the Court rules the law constitutional or only part of it is unconstitutional, the lawsuits will move forward. If the court rules against the whole Act, then it’s an immediate win for the plaintiffs and we return to the status quo of strong religious freedom protections. Scot asked what the likelihood for that is. Kim said her sense is the Court will strike down part of the Act and these cases will move forward in court and they will win. Scot asked Kim what she hopes to come from the Fortnight for Freedom. She wants her own kids to see Catholic standing together on an important issue. It’s also a wakeup call about what’s going on with religious liberty. Even if it seems like it’s removed in Washington, the Fortnight can bring this home to parishes. Scot said he’s been thinking about those who gave their lives in our history for the sake of religious freedom. What message would Kim have to the listeners on why we should educate ourselves and do something about this now? Kim said religious liberty isn’t always attacked in a grand way, like bombing of churches and Christians being murdered. What we have here is the slow whittling away of our religious liberty. But this will really affect all of us. It will set the precedent in the law that religion is what happens within the four walls of a house of worship.